As a boy growing up in Shadwell, Virginia, Thomas Jefferson was fascinated by the Native Americans he saw passing by his home and by a large earthen mound he saw them visiting. His childhood curiosity led him as an adult to conduct one of the first studies of another culture through careful scientific excavation and analysis. Examining the layers of soil and materials he found within the mound, Jefferson was able to show that ancestors of the local Monacan Indians had created these ceremonial places many years ago. This disproved the popular myth that these mounds were created by a long-vanished civilization. He then published his results in his only book, Notes on the State of Virginia. 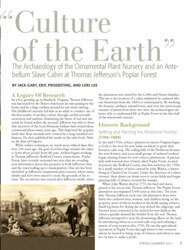 This article was excerpted and condensed from the booklet “Culture of the Earth,” written by the staff of the Poplar Forest Department of Archaeology and Landscapes: Jack Gary, director; Dr. Eric Proebsting, associate archaeologist; and Lori Lee, laboratory supervisor. The text has been edited for Lynch’s Ferry readers. The authors wish to acknowledge that this project is made possible by a grant from the U.S. Institute of Museum and Library Services and support from Thomas Jefferson’s Poplar Forest. Special thanks to Poplar Forest’s board of directors and President Lynn Beebe for their vision and support of the ongoing research into this important property. Numerous individuals, foundations, and organizations have contributed to the excavation, laboratory analysis, and research of these two sites.